Traveling with your pet can be a great experience for you, your pet and your fellow travelers. Your pet will enjoy new scenery and gets out of the same old routine. You get to enjoy your friend in new and exciting circumstance. In addition, you'll travel without the worries and expense associated with leaving your "best friend" behind in someone else's care. Well behaved pets add character and pleasure to most situations. It's well documented that pets can lower the blood pressure and heart rate of humans with whom they come in contact. What better time to receive maximum results of this benefit than while traveling and on vacation? The safety and comfort of your traveling companion (two or four-legged) should be a primary concern. Ensure the climate and circumstances at your destination are right for your pet at the time of year you plan to travel. Not everyone loves pets (or your pet) as much as you do. Respect the personal space of other travelers and don't let Rover rove over to others not otherwise interested in your pet. A new location does not necessarily bring out new ability or restore fitness in an sedentary pet. Be cognizant of your pet's fitness level and ability. If it's going to be an active vacation, work up to a higher level of fitness and activity in the days before your trip. Take supplies to cover you in the event of an unexpected delay (cancelled or delayed flight, car trouble, etc.) A small amount of food, water, a couple of toys and poop bags are essential and don't take up much room. If there's room, your friend's bed or favorite blanket with be a comforting item when you reach new and unfamiliar surroundings. Consider packing a small first aid kit, just in case. If you are traveling when the weather is likely to be hot, make sure your air conditioning system is fully functional. Consider having it serviced before you begin your journey. When traveling by air, check with the airline when you begin planning your trip. Policies vary by carrier, destination and time of the year. Most pets will have to travel as cargo without heat or air conditioning. Some airlines prohibit flying your pet during certain times of the year. If your path takes you to the beach or other wilderness, bring a couple of towels to clean up with afterwards. Not all hotels or stops along the way will be setup to accommodate wet or dirty pets. For pets that will join you on the furniture and bed, consider bringing a couple of sheets to cover furniture that isn't yours the during your stay. Know the leash laws and restrictions on where pets can and cannot go at your destination. An unfortunate encounter with an Animal Control officer can ruin a holiday for everyone. 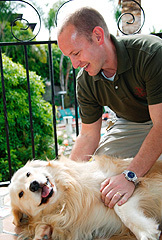 Know where a 24 hour Vet, the pet store and ideally a pet sitter are in your destination. A pet sitter can free you up to enjoy attractions where your "best friend" may not be permitted. You should avoid leaving your pet in a hotel room unattended. Most hotels with Pet Policies do not permit unattended pets in rooms, kenneled or not. Keep and take with you a file of your pet's heath records, just in case you decide to board along the way or in the event of an unscheduled trip to a Vet in a new area. Happy trails and happy tails!